Here at Knitting Daily we're celebrating the release of our new book New England Knits by Cecily Glowik MacDonald and Melissa LaBarre. We love it so much that we're offering you a free pattern to whet your appetite for the wonderful designs in this amazing book! 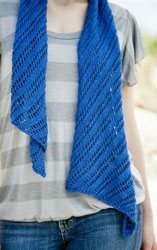 The Wakefield Diagonal Lace Scarf by Melissa LaBarre is formed with lace pattern that creates a natural bias in the fabric, resulting in a parallelogram shape. 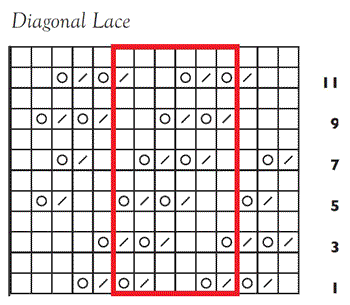 The simple stitch pattern is easily memorized and almost hypnotic. Wrap it around your neck a few times to keep warm, or wrap it once loosely for a perfect accessory for transitional weather. So here you go! 60" (152.5 cm) long and 101/2" (26.5 cm) wide. Shown here: Mirasol Tupa (50% merino, 50% silk; 137 yd [125 m]/50 g): Viridian #804, 3 skeins. U.S. size 7 (4.5 mm). Adjust needle size if necessary to obtain the correct gauge. 14 sts and 25 rows = 4" (10 cm) in patt. Row 1: (RS) *K1, k2tog, yo, k2tog, yo, k1; rep from * to last 2 sts, k2. Row 3: *K2tog, yo, k2tog, yo, k2; rep from * to last 2 sts, k2. Row 5: K1, k2tog, yo, *k2, k2tog, yo, k2tog, yo; rep from * to last 5 sts, k2, k2tog, yo, k1. Row 7: *K2tog, yo, k2, k2tog, yo; rep from * to last 2 sts, k2. Row 9: K3, *k2tog, yo, k2tog, yo, k2; rep from * to last 5 sts, k2tog, yo, k2tog, yo, k1. Row 11: *K2, k2tog, yo, k2tog, yo; rep from * to last 2 sts, k2. Rep Rows 1-12 until piece measures 60" (152.5 cm) from CO, or desired length, ending with a WS row. With RS facing, BO all sts pwise. Weave in loose ends. Block to measurements. You can make a wider scarf by casting on additional stitches in multiples of 6. Just remember, the final count must be a multiple of 6 stitches plus 8 additional stitches to balance out the pattern. To make this a wrap that's nearly double the width, you can work the pattern over 92 stitches. You'll need to double the yarn amounts to make the wrap the same length as the scarf. Enjoy this pattern, and don't forget to check out New England Knits. P.S. And if you're in the New England area, click here to see the author tour dates and locations!